Publisher: BMG Records (Pilipinas) Inc.
- Pillmate Of The Month: The Most Scrumptious Chick with Luscious Legs Unveiled! Hot Hot Hot!!! - And Noel Bares ALL!!! (C) 1998 BMG Records (Pilipinas) Inc.
Don't get confused! This is the sequel to the first Pillbox; intentionally called, Pillbox "3" just for the heck of it! 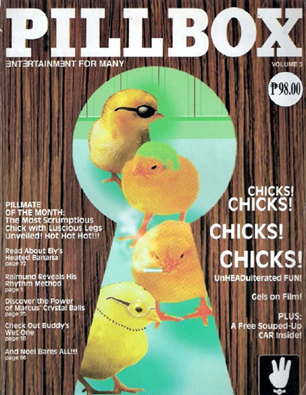 This magazine is already out-of-print!